A $20 fee will be charged per person if NOT canceled 24 hours prior to reservation. Sip on Mimosas and enjoy views of a cascading waterfall. Enjoy our fabulous Sunday Champagne Brunch with fresh local seafood, carving stations, breakfast favorites, and desserts. Our offerings vary featuring items such as Braised Beef Short Rib, Mahi Mahi with Roasted Pepper Coulis, and Butternut Squash Ravioli with Hazelnut Cream Sauce. Was there for lunch so not many crowd, I was one of the few tables occupied. Atmosphere and ambience was excellent but food was not up to standard. Pork pot stick was soaked in oil and sauce, and clam chowder only has very small bits of clam. Only saving grace is waiter was very attentive. Will I go again, maybe not. The environment was quiet and a lot of space. The food is good and the waiter who served our table is excellent. Convenient location and atmosphere. Good food with good value. Plenty of parking. Would go again. Wonderful Holiday Brunch with exceptional food selections for our entire family including vegetarians, gluten-free adherents, and nut allergy members. 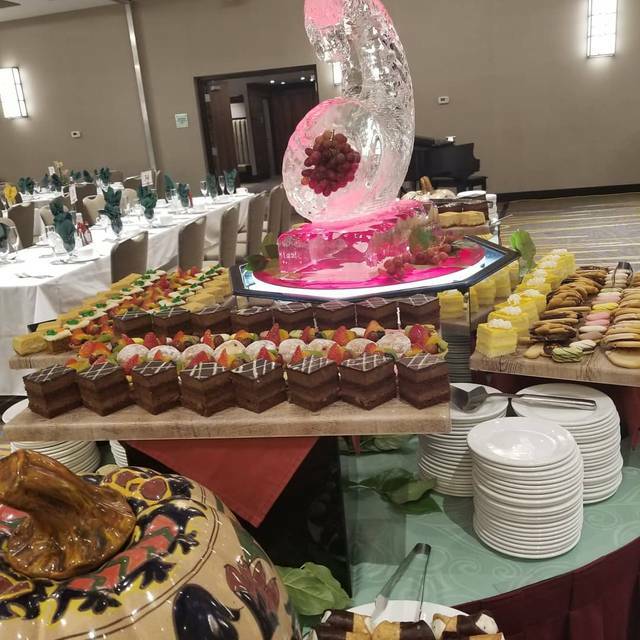 So many outstanding items to choose from on the very large buffet including hot and cold items, items made to order, outstanding selection of desserts all while the champagne flowed and juices and sodas included for the children. We can't wait to go back again. One of the few Sunday champagne brunches still available. Chefs went over & above to make special & delicious food. Service was outstanding. Our favorite place to celebrate. Great service starting from the restaurant manager, Elsa. Great for group dining. Thanksgiving Brunch was my family's first experience of eating at Cafe Florian. It was really well done. We all enjoyed ourselves immensely. I would recommend it to anyone. It's more than enough food. The variety was outstanding. Everything tasted so fresh. We were all very pleased. Came here for the Thanksgiving brunch and was amazed. They were very busy yet the staff remained attentive. The food selection and quality was delicious... traditional thanksgiving fare with prime rib, crab, and oysters. Highly recommend! Thanksgiving brunch was awesome. Special thank you to Elsa for confirming outer reservation and making sure we had great seating for our large party. There was a large selection of seafood, fruit, potatoes, desserts and turkey to celebrate the holiday in pure deliciousness! The live music, carving stations and desserts was a nice addition to the ambiance of the ballroom. This was a great way to spend the holiday with our dpfamiky without spending the entire day cooking! What a great way to spend Thanksgiving! The food, service, ambiance, and variety of food was perfect and delicious for our family! This is my go-to brunch spot and I have always enjoyed great service. I only wish that their salad bar had more topping options. They used to serve great pasta salads with a Caesar option but those were gone when I went yesterday. I would also like a second meat option at their carving station, like a pork roast, to accompany prime rib. I will definitely still go but would love to see some of that variety. Like the variety of buffet.Salad bar needs a little bit more. Needs more fruit. Went there for Sunday brunch. Great service and ambiance; however, I thought there would be more assortment of different food items. Nothing really was unique or really stood out. Prime rib was tender and juicy. Build your own omelet was good. We had Sunday Brunch here. Plenty of choices, but I felt the Quality wasn't there. The staff were all very pleasant. I arrived on time, and finally found where the restaurant was supposed to be. Spoke with several staff members who did not know what was going on. Finally, I went to the desk clerk who said that the Cafe was closed that night because of an "emergency". There were no signs or directions. clerk directed me to the Bistro which is a dark, dingy space behind what I suppose might be Cafe Florian. Server was less than friendly, so I just left. Not motivated to return to find out if Cafe Florian really exists. Great brunch spot! Outstanding service! Highly recommend! Very nice surprise. Hidden away in the Crown Plaza. Great service & great food. I’ll go again. Everything was outstanding! Loved spending Father's Day there! Nice ambiance for a hotel restaurant. Sunday brunch is good enough to go back to every time I'm in town (3 times/year). "Prime" rib, dungeness crab, Asian food, cheeses, fish, etc. Need reservations. It's not top notch gourmet, but if you like variety, it's good. Hostess and waiters are gracious and accommodating. Food was awesome and the wait staff Gerardo was amazing. Worst buffet for the price. Way over priced. Servers were annoyed anytime you asked for anything. Had to get up several times to ask for drink refills. Food was amazing, staff was smiling and helpful and I would definitely say I had an amazing experience for our Mother’s Day champagne brunch! I love the Sunday brunch. The Mother's day brunch is one of the best I've been to. The food was great, the service was exceptional. Would go there more frequently but brunch was pricey at $65 per person. Our group of 5 paid over $300. How much can a person eat! Anyway will go as often as my wallet will allow. Mother’s Day brunch was very enjoyable. Great for groups. My family enjoyed themselves and definitely want to go again. I’ve been patronizing Cafe Florian over 15 years. They always deliver an overall great experience. I have taken many guests and all have raved about the experience. I will continue to come back with my family. Cafe Florian was a pleasant surprise. We went for the Mother's Day 2018 Brunch and were not disappointed. Our waiter was friendly and attentive, refilling glasses and clearing away used dishes without prompting. The food selection satisfied everyone in our group, including the vegan! The setting was lovely and the noise level was nearly non-existent. The Café has a lovely setting and a terrific staff. I look forward to returning and would glad recommend it to anyone. check-in station which is where we ended up going. The food was OK. We know that somewhere there was a dessert table, but we could never find it. A lot of the food was cold, notably the scrambled eggs. The Siumai wasn’t very good either. It was just OK. I thought that it was expensive for what it was. Also, the oysters that they chose were pretty horrible, and I love oysters generally. Just OK. I would go back maybe in a year or so, but I don’t know that I would make it a regular thing. The restaurant is beautiful, and the waterfall is pretty. Service was excellent. Met for a small, casual family gathering. Had a delightful breakfast. We were able to relax and enjoy our meal without being rushed. I had a delicious meal: avocado toast with spinach and tomatoes, topped with a poached egg. This was by far one of the best brunches I have been to in a long time. The food was excellent, except for the prime rib which was very pink. The service was excellent for such a large crowd. It was expensive, but for an Easter Brunch I guess not. I definitely would go there again with my family. I hadn’t been there in years. It was just as good as I remember! There was a large selection of food for this Easter Sunday Brunch. We had a great time with the family.